Chief Black Kettle (Cheyenne, Moke-tav-a-to) (born ca. 1803, killed November 27, 1868) was a leader of the Southern Cheyenne after 1854, who led efforts to resist American settlement from Kansas and Colorado territories. He was a peacemaker who accepted treaties to protect his people. He survived the Third Colorado Cavalry's Sand Creek Massacre on the Cheyenne reservation in 1864. He and his wife were among those killed in 1868 at the Battle of Washita River, in a US Army attack on their camp by George Armstrong Custer. 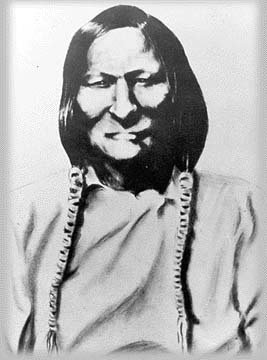 Little is known of chief Black Kettle's life prior to 1854, when he was made a chief of the Council of Forty-four, the central government of the Cheyenne tribe. The Council met regularly at the Sun Dance gatherings, where they affirmed unity. After 1851, Cheyenne-US relations were conducted under the Treaty of Fort Laramie. But, the US government was unwilling to control white expansion into the Great Plains, especially after the Pike's Peak Gold Rush began in 1859. European Americans displaced the Cheyenne from their lands in violation of the treaty, and consumed important resources of water and game. Increasing competition led to armed conflict between the groups. Black Kettle was a pragmatist who believed that US military power and the number of immigrants were overwhelming. In 1861 he and the Arapaho surrendered to the commander of Fort Lyon under the Treaty of Fort Wise, believing he could gain protection for his people. The treaty was highly unfavorable to the Southern Cheyenne. They led their bands to the Sand Creek Reservation, a small corner of southeastern Colorado about 40 miles from Fort Lyon. The land was not arable and was located far away from buffalo, their major source of meat. Many Cheyenne warriors, including the Dog Soldiers would not accept this treaty. They began to attack white settlers. Whether Black Kettle opposed these actions, tolerated them, or encouraged them is a controversy among historians. A delegation of Cheyenne, Kiowa, and Arapaho chiefs in Denver, Colorado in September 28, 1864. Black Kettle 2nd from left front row. A delegation of Cheyenne, Kiowa, and Arapaho Chiefs in Denver, Colorado in September 28, 1864. By the summer of 1864, the situation was at boiling point. Southern Cheyenne hardliners, along with allied Kiowa and Arapaho bands, raided American settlements for livestock and supplies. Sometimes they took captives, generally only women and children, to adopt into their tribes to replace lost members. On 11 July 1864, Indians killed a family of settlers, an attack which the whites called the Hungate massacre after the family. Pro-war whites displayed the scalped bodies in Denver. Colorado governor John Evans believed tribal chiefs had ordered the attack and were intent on a full-scale war. Evans issued a proclamation ordering all "Friendly Indians of the Plains" to report to military posts or be considered "hostile." He sought and gained from the War Department authorization to establish the Third Colorado Cavalry. John Chivington led the unit, composed of "100-daysers," whose limited term was specifically for fighting against the Cheyenne and Arapaho. Black Kettle decided to accept Evans' offer, and entered negotiations. On September 28, he concluded a peace settlement at Fort Weld outside Denver. The agreement assigned the Southern Cheyenne to the Sand Creek reservation and required them to report to Fort Lyon, formerly Fort Wise. Black Kettle believed the agreement would ensure the safety of his people. After he went to the reservation, the commanding officer at the fort was replaced by one who was an ally of Chivington. "[H]e stopped all persons from going on ahead of him. He stopped the mail, and would not allow any person to go on ahead of him at the time he was on his way from Denver city to Fort Lyon. He placed a guard around old Colonel Bent, the former agent there; he stopped a Mr. Hagues and many men who were on their way to Fort Lyon. He took the fort by surprise, and as soon as he got there he posted pickets all around the fort, and then left at 8 o'clock that night for this Indian camp." At dawn on November 29, Chivington attacked the Sand Creek reservation. Most of the warriors were out hunting. Following Indian agent instructions, Black Kettle flew an American flag and a white flag from his tipi, but the signal was ignored. The Colorado forces killed 163 Cheyenne by shooting or stabbing. They burned down the village encampment. Most of the victims were women and children. For months afterward, members of the militia displayed trophies in Denver of their battle, including body parts they had taken for souvenirs. Black Kettle escaped the massacre, and returned to rescue his severely injured wife. He continued to counsel pacifism, believing that military resistance was doomed to fail. The majority of the Southern Cheyenne chiefs disagreed. Allied with the Comanche and Kiowa, they went to war against US settler and forces. Although wrongs have been done me, I live in hopes. I have not got two hearts.... I once thought that I was the only man that persevered to be the friend of the white man, but since they have come and cleaned out our lodges, horses, and everything else, it is hard for me to believe white men any more. Black Kettle moved south and continued to negotiate with US officials. He achieved the Treaty of Little Arkansas River on October 14, 1864. By this document, the US promised "perpetual peace" and lands in reparation for the Sand Creek massacre. However, its practical effect was to dispossess the Cheyenne yet again and require them to move to Indian Territory (present-day Oklahoma). Black Kettle's influence continued to wane. Roman Nose and his Dog Soldiers took a prevailing hard line and continued warfare. Black Kettle's dwindling band proclaimed their desire to live peacefully alongside European Americans. Black Kettle signed yet another treaty, the Medicine Lodge Treaty on October 28, 1867. But, the Dog Soldiers continued their raids and ambushes across Kansas, Texas, and Colorado. The relationship between the two groups is a subject of historical dispute. According to Little Rock, second-in-command of Black Kettle's village, most of the warriors came back to Black Kettle's camp after their attacks. White prisoners, including children, were held within his encampment. By this time Black Kettle's influence was waning, and it is unclear whether he could have stopped the younger warriors' actions. Washita River, vicinity where Chief Black Kettle was killed. In response to the continued raids and massacres, General Philip Sheridan devised a plan of punitive reprisals. He planned to attack Cheyenne winter encampments, destroying both supplies and livestock, and killing any people who resisted. At dawn on the morning of November 27, 1868, George Armstrong Custer led troops to attack Chief Black Kettle and his village. They were camped along the Washita River. Custer's troops killed more than 100 Native Americans, mostly Southern Cheyenne. While trying to cross the Washita River, Black Kettle and his wife were shot in the back and killed. The Cheyenne have recognized Black Kettle as a great peacemaker. Some historians have criticized him for failing to stop raids and for massacres committed by warriors from his camp. Near the site of his death, the Black Kettle Museum commemorates the peacemaker in present Cheyenne, Oklahoma. In popular media, Black Kettle, a Cheyenne chief, was a recurring character in the CBS family drama Dr. Quinn, Medicine Woman for its first three seasons. Black Kettle plays a key role for the series in the pilot episode. Dr. Quinn saves Black Kettle's life by performing a tracheotomy and removing a bullet lodged in his neck. She later receives a Cheyenne name from Black Kettle meaning "Medicine Woman." He was played by Nick Ramus. On ska band Five Iron Frenzy's Our Newest Album Ever, the song "Banner Year" is about Black Kettle, how he was betrayed, and his eventual murder at the hands of Custer. Wikimedia Commons has media related to Black Kettle. ↑ Mo'ôhtavetoo'o in the current orthography. See Cheyenne Names by Wayne Leman. ↑ Who is the Savage?. PBS: The West Film Project. 2001. Retrieved 2011-07-13. ↑ Welch, James; Paul Tekler (1994). Killing Custer. New York: Penguin Books. p. 62.